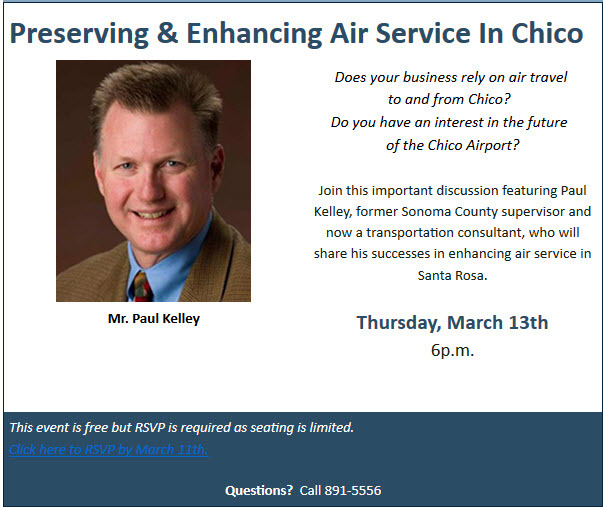 Next Thursday, 13 March, at 6 pm, the Chico Chamber of Commerce is sponsoring a meeting to discuss Chico’s commercial air service. All interested members of the Chico area business community, Chamber members or not, are encouraged to attend. The headlining speaker at the event will be Paul Kelley, a four term former member of the Sonoma County Board of Supervisors. After Santa Rosa lost all of its air service in October 2001, Kelley led the effort that resulted in Horizon Air launching flights to Santa Rosa from Los Angeles and Seattle in March 2007. (Since then service has expanded to Portland and San Diego.) The approach he created was long-term and comprehensive, a model that Chico should emulate if it is interested in preserving and expanding its commercial air service. There is no charge to attend the event, but the Chamber asks all attendees to register either by phone (891-5556) or by email (info@chicochamber.com). The location of the meeting depends on how many people register.